Summer reading for grades 3-5, with activities! Pick any book from this list of the best kids' books and your students will be sure to have fun reading and doing the activities over the summer break. Activities are designed to help reinforce reading skills learned during the school year while home on summer break. Great for use as a family reading activity or playgroup sessions. Being able to jump into books used to seem like the greatest thing in the world to Owen Conners. But now Owen’s trapped in a time travel book where readers—that would be you—decide how the story goes. As if that weren’t enough, Owen’s also stuck in a prison for time criminals in a prehistoric era. He’s surrounded by bizarre fellow prisoners, including Kara Dox. How does Kara recognize Owen if they’ve never met before? She seems to think they’re old friends, but that can’t be possible. Still, Kara might just be the only chance Owen has to escape. And he has to find a way out to save his friend Bethany, who’s still in grave danger. Because unless Owen can stop him, Nobody is going to split Bethany into two, separating the fictional and non-fictional worlds forever. Gus and Cassie have always been on the same team off the field, but in this third novel in New York Times bestselling author Mike Lupica’s Home Team series can they stay friends when they’re on the same court? Gus knows Cassie is more than good enough to compete on the boys’ team, and besides they really do need a point guard, so why isn’t he able to shake the feeling that she belongs on their bleachers rather than their bench? Can Gus find a way to bring the home team together both on and off the court, or will all these prejudices block their shot at a winning season?. Jethro Creighton is nine years old in April 1861, when the Civil War begins. His southern Illinois farming family is torn apart when his brothers, cousin, and a close family friend leave to fight in the war. Jethro is forced to grow up quickly and tracks the progress of the war through letters and newspapers. Finally, four years later, the war is over and all are relieved. But then President Lincoln is assassinated. Suddenly, the future becomes frightening and uncertain once again. Children have been waiting patiently for the chocolate gates of Willy Wonka's chocolate factory to open. The twist is that only five lucky children can be let inside. Charlie Bucket's dream comes true when he finds a winning ticket that allows him to go into the chocolate factory. Moss, the Native American hero of Michael Dorris' book Guests, learns to recognize the complex emotions within himself and his elders when his tribe invites white settlers to share the harvest feast. Jean Fritz wrote a compelling story about her youth in the China of the mid 1920's, a period of great turmoil. Jean's own family suffers the loss of her younger sister, as well as other hardships. Eventually, the family resettles in the United States, a country that Jean has only heard about. The book is based on the real-life story of a 12-year-old American Indian girl, Karana. In the early 1800s, she was stranded on a small island off the coast of California. Karana faced grave dangers and survived, in isolation, for 18 years before leaving the island to live in the Santa Barbara Mission. For James Henry Trotter, life with the exceedingly nasty Aunt Sponge and Aunt Spiker is pure misery. Jame dreams of a better life, but he's totally unprepared for the wild adventures ahead of him when he drops the magic crystals he receives from a strange old man. Before long, James is off on a weird, wonderful journey inside a giant peach with an odd assortment of traveling companions! 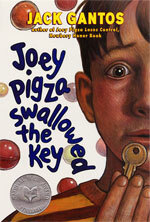 Number the Stars won the Newbery Award in 1990. This moving, well-written book, helps children to see the effects of courage and caring. The factually-based story is set in Denmark during World War II and tells of that country's efforts to save their Jewish citizens. Two young girls are the focus - each having poignant tales to tell. Look at our collection of ideas and resources to enhance this important book. In the Newbery Award winning book The Summer of the Swans, Sara's life is turned upside down when her mentally retarded brother disappears. Her brother Charlie loves to go to the lake and watch the swans. Late one night he gets out of bed to follow them and becomes lost in the dark. What follows is a desperate search for the young boy and an unexpected friendship.